The T model is an industrial-duty trolley door opener, as manufactured by The Chamberlain Group and is for use on standard lift sectional doors. It is rated for more than 12 cycles per hour during peak periods. Continuous‑duty high‑starting torque motor with instant reverse. Quick‑mount header bracket which provides fast, swing‑up installation. Single‑or three‑phase, capacitor start on single‑phase. Spring‑loaded disconnect for emergency manual operation. Wiring type: All operators are factory preset to C2 wiring, providing momentary contact to open and stop, with constant contact to close. Monitored entrapment protection, using approved photo sensors CPS‑U are standard. All other wiring types, B2, T, TS and FSTS, can be selected with the selection of a switch. 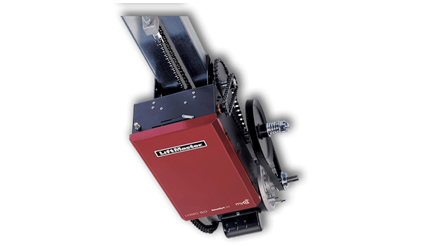 LiftMaster CPS‑UN4 and CPS‑RPEN4 photosensors or a monitored 4‑wire sensing edge (via a CPS‑EI Edge Interface card) are optional. Logic 4.0 door openers can only accept UL‑approved LiftMaster CPS‑U, CPS‑UN4, CPS‑RPEN4 or CPS‑EI monitored entrapment protection devices. First‑stage heavy‑duty 5L V‑belt; second #41 chain; output on trolley #48 chain on 1⁄3 and ½ HP; #41 chain on ¾ and 1 HP. Solenoid‑actuated brake is standard on ¾ and 1 HP units to prevent coasting of door. Solenoid‑actuated brake is standard on 3/4 and 1 HP units to prevent coasting of door. Ball bearings on output shaft; heavy‑duty, oil‑filled bushings on reduction shafts. NEMA 1 type electrical box, heavy‑duty 11‑gauge steel frame with durable powder coat finish, all reduction sprockets drilled and pinned to shafts. High‑strength dual L‑rail track with nylon quiet‑gliding chain guides on rail spacers for quiet, smooth operation. 1.5-second delay‑on‑reverse circuit to prevent premature door and operator wear. The timer‑to‑close automatically closes the door - programmable in 1‑second or 15‑second increments. The mid‑stop stops the door at programmable mid‑stop during open travel. The presence of primary entrapment protection is standard CPS‑U for all modes. Primary entrapment protection devices are monitored continuously to ensure safe operation of the door and limit door opener functionality should an obstruction be detected or in the event of device failure. 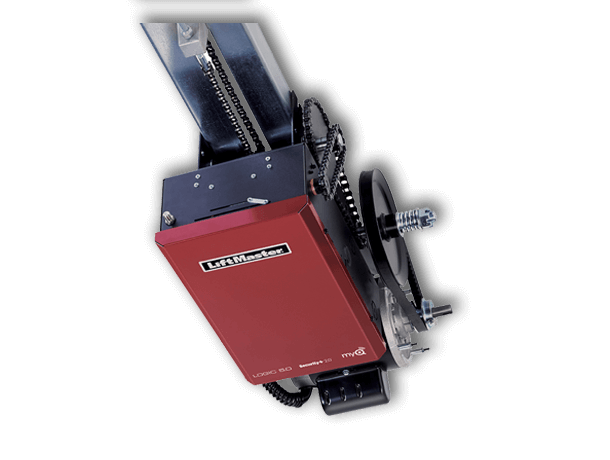 Optional LiftMaster monitored entrapment protection devices, CPS‑UN4, CPS‑RPEN4, and CPS‑EI, are designed to work in conjunction with LiftMaster commercial door openers to provide enhanced door safety and a broad range of modes and features to end users. Either monitored photo‑sensor or monitored 4‑wire sensing edge (in conjunction with the CPS‑EI Edge Interface) protection may be selected, but one must be detected by the LiftMaster Logic 4.0 or Medium‑Duty Logic circuit board in order to unlock full functionality.